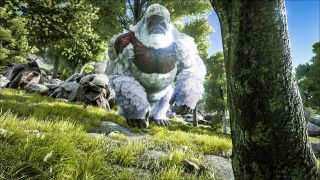 The final Ark: Survival Evolved tournament of 2015, appropriately called Survival of the Fittest: The Last Stand, has begun! Studio Wildcard says it will the "biggest and fiercest" event it's held so far, with more than $60,000 in prizes up for grabs. The first preliminary round is actually already underway, and will wrap up tomorrow (September 26) in an open-to-all contest that will run from 12pm to 8 pm EDT. Further preliminaries will be held on September 29, October 1, 3, 6, 8, 10, and 13. Winning tribes will be invited to the "Last Stand Pre-Championship," which will run during the same hours on October 17 and October 20, and the 160 final survivors from that shakeout will be joined by 70 Twitch streamers an in "epic and ultimate tournament" set for October 24. The Last Stand will be a little different than previous Survival of the Fittest tourneys. Among the changes are "extra-large" tribes made up of six players, three boss creatures—the Broodmother, the Dragon, and the new Giant Ape—who will appear at the central platform to be tamed at "key points" during the match, four new evolution events triggered by player voting, and acid rain, which will damage armor and drain health. And now to the important bit: Prizes! The winning tribe will earn $24,000 (split between the six players), second place nets $12,000, and third is worth $6000. All three will be given an in-game gold/silver/bronze "trophy structure skin" customized with their tribe details, and all Last Stand finalists will receive a $100 Steam gift card. Also important, I suppose, are the preliminary server names. Behold! "[LAST STAND][EU] Prelim 1 (On Nitrado)"
"[LAST STAND][EU] Prelim 2 (On Nitrado)"
"[LAST STAND][EU] Prelim 3 (On Nitrado)"
If you're interested, you will probably want to check out the full Survival of the Fittest: The Last Stand announcement on Steam.